Click the image to hear Above the Sound of Gravity. Enter a world between heaven and earth and experience a delicate tapestry of tranquil melodies and soundscapes. The enchanting blend of flute and vibraharp transports you into a deep healing and meditative state. Ideal music for massage, reiki, shiatsu, acupuncture and yoga. 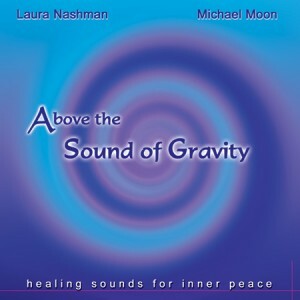 “Above the Sound of Gravity Gets Two Thumbs Up”-the therapeutic potential of this CD lies in its absence of structured sounds and rhythms. This spa is a synthesis of Dr. Lerner’s various training and experiences in medicine, (rehab and pain management) music (therapy and composition) as well as wellness and wholistic strategies. “Laura Nashman’s fine flute playing soars with inspiration and universal appeal. This is ideal music for relaxation, yoga, massage or bodywork. Her beautifully selected songs and authentic instrumentation take the listener on a journey into melodies of peace and joyous tranquility. As a wholistic therapist and relaxation consultant, I use Laura’s music to complement the healing modalities and to integrate body, mind and spirit. I highly recommend Laura’s CD’s for alternative health practitioners, for spas and for anyone who wants to soothe the soul and relax with a beautiful collection of music.